Writer/Director Li Yang is best known for getting to the heart of corruption in China. His previous film, Blind Shaft, looked at corruption in Chinese coal mining, and his latest, Blind Mountain, takes an even more disturbing look at the dreaded crime that is human trafficing. While Yang didn�t exactly have the backing of the Chinese government in the making of Shaft, he surprisingly had their support in shooting Mountain. Apparently, even stringent government officials couldn�t turn a blind eye on the true crime of selling a human being in exchange for money. This devastating subject has never been told in such a harrowing, effective way as Yang has done with Blind Mountain, and kudos to Kino Home Video for bringing the film to DVD and allowing a wider audience to experience something that everyone should see. Bai Xuemei (Lu Huang) is a beautiful, intelligent college student who travels to a small mountain village with a pair of seemingly friendly strangers, one of whom she thought was a good friend. They stop for food and drink with a local family, and the next thing Bai knows, she�s waking up in the family�s house, with no sign of the people she arrived with or her ID. Bai soon realizes that she has been sold to this family and is soon to be married to the rather ugly man of the house. Attempts at escape prove futile, given that the entire village believes in such female slavery, but if she meets the right person with the right amount of money, there still might be hope for Bai to regain her freedom. Blind Mountain is the latest in a recent human trafficking fixation in modern cinema, with films like Trade and the long-on-the-shelf but soon-to-be-in-theaters Liam Neeson vehicle Taken among the most recent in the subgenre. Li Yang�s take on the subject is an important one, to say the least. While no one in the village, aka Bai�s living prison, sees anything wrong with buying women for the purpose of providing a male heir to the family, it�s clear to anyone with a soul that this is one of the worst things a human being could do to someone, and Yang presents his story humanely, yet, thankfully, without pulling any punches. Li Yang�s brutal approach is a necessary one as this film hammers home just how horrible of a crime this is. He�s unrelenting in putting us right there with Bai, as with each and every escape attempt, we feel hope along with her, and are subsequently emotionally dragged down right along with her when she�s inevitably caught. His story wouldn�t be as effective if it wasn�t for the daring performance from Lu Huang as the tormented Bai. In a role that could have easily been overacted, Huang remains restrained and believable throughout, doing some of the best work of the year, which, sadly, will likely go unnoticed come awards season. While it�s often tough to watch Huang play such a helpless character, who is constantly under diress, Yang�s film is one that you�re not likely to forget for quite some time after your first viewing, and isn�t that what moviegoing is all about? Image Transfer Review: This 1.85:1 anamorphic widescreen presentation is not without its share of problems, including inconsistent black levels that make it difficult to make out distinct images during nighttime sequences. Softness is a glaring problem as well, although there are some instances where images are sharp and detailed. Audio Transfer Review: The Dolby Digital 2.0 audio is unremarkable, but it does serve this dialogue-driven film well in that the actors� speech is always crystal clear. The rest of the sound effects and music stay up front for the most part, but they are seamlessly integrated with the dialogue to produce a nice mix. Extras Review: Unfortunately, the only extra feature is a stills gallery. 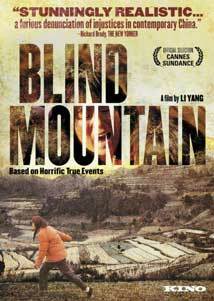 There�s nothing even remotely �feel-good� about writer/director Li Yang�s second feature film, Blind Mountain, but it�s arguably one of the most important films to ever come out of China. With an award-worthy performance by Lu Huang at its center, Yang�s movie is as powerful as it is disturbing. Unfortunately, Kino�s DVD release isn�t as impressive as the film itself with decent audio, problematic video, and nothing in the extras department.